How is Top Window Cleaners any different from the competition? Contact us at any time for a detailed, no obligation estimate based on the type, amount, and the accessibility of the windows that your property has. Benefit from affordable window cleaning solutions for single & double windows, French doors, skylight windows, conservatory glass roofs and more. The window washers will use nothing but purified water to polish all glass surfaces, window frames, and ledges and leave them streak-free. The extendable water-fed pole technology we utilise allows the specialists to polish external windows up to the fourth floor without the use of ladders. A technician can arrive to do his window cleaning services on any workday, weekend, and even on official holidays. 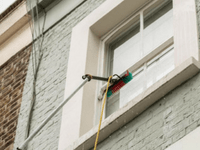 Each of the London window cleaners is trained, wears a uniform, and their performance is frequently evaluated by a quality control supervisor. Using water-fed pole technology to clean windows up to the 4th floor of any property without a single drop of detergent. Suitable for high-rise office buildings, food venues, and more with the use of water fed pole or rope-access methods. Unblocking gutters and downpipes from all sorts of natural debris (leaves, branches) using a powerful vacuum cleaning machine. Streak-free cleaning of conservatory windows using a water-fed pole on the outside and ladders and squeegees on the inside. Using a jet washer to remove moss and other dirt from your driveway and garden patio to restore the original appearance. Book any of our services in 3 easy steps! Contact one of our service representatives over the phone or online. Tell them what you need and pick a convenient date for the service. Meet up with the window cleaning expert on site and let him handle the rest. Q: Do I need to supply your window cleaning equipment with water? A: No, there is a container filled with purified water in each of our vans. A water pump will then send the liquid up the pole and release it under high pressure through the brush head at the end. Q: When booking windows cleaning, do I need to reserve a parking slot? A: Since the cleaning equipment is built into each vehicle, we kindly ask you to reserve a parking slot that is within 30 metres from your property and on the same side of your windows. Q: Are your cleaners trained and fully insured? A: Yes, each of the professional London window cleaners carries a substantial public liability insurance for your peace of mind, has passed all relevant training courses, and carries the proper equipment for the job. Q: Can you clean windows on the inside, too? A: Absolutely! For this task, however, the specialists will use a traditional squeegee and a ladder to reach the furthermost corners of your glass surfaces. Q: Do you treat wooden frames and sills? A: We work exclusively with PVC-made window elements. Treating wooden surfaces is not something we do since the paint can potentially wash away and leak over the windows. Q: Do I need to stay at the property while you clean? A: Not necessarily – upon request, we can organise a key pick-up and delivery service. Check out what the customers are saying about our services performance. Leave a review and help others make an informed choice. Like what we have to offer? Here are 3 ways you can get in touch! Dial 020 3404 9775 to instantly get in touch with one of our representatives.